One of our favorite restaurants in Richmond was a little corner place in the Fan called Kuba Kuba – a perfect Cuban restaurant with great, authentic entrees under $10 and Miller High Life pony beers for $1 (they also had a good selection of Caribbean beers for a big night on the town). With most authentic entrees came a side of deliciously fried plantains. You can taste the resemblance to bananas, but just barely. The sweetness is replaced by starch, and with the right amount of salt, they’ll quickly replace fries as your go-to fried starch. One of our friends here in Atlanta had us over to dinner and showed us how to make these awesome fried morsels. It’s a really simple and inexpensive side item for a meal. It goes great with Cuban or caribbean inspired cuisine, but I would be more than happy to sit down to fried plantains beside a burger or other American protein where french fries would normally appear. 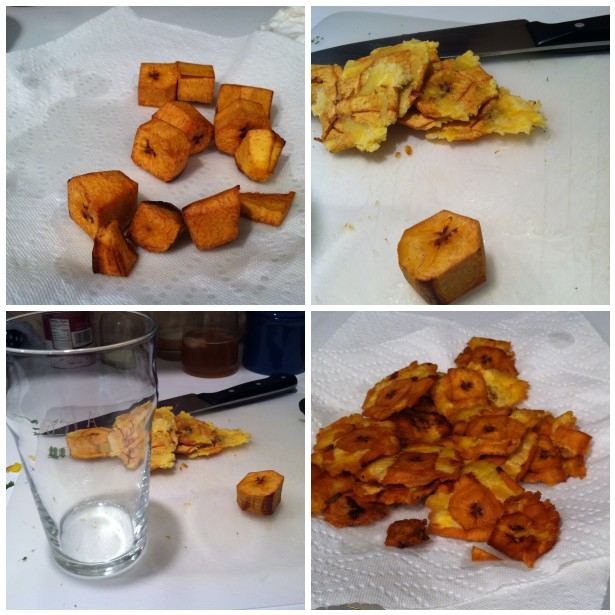 We had a plantain tree in my backyard growing up! Dad would make fried plantains for my espanol class. 🙂 See ya’ll soon!